The picture superiority effect says that pictures are remembered better than words, especially when people are casually exposed to the information and the exposure is for a very limited time. When information recall is measured just after exposure to a series of pictures or a series of words the recall for pictures and words is about equal. 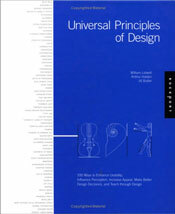 However, the picture superiority effect applies when the time after exposure is more than 30 seconds, according to the research cited in Universal Principles of Design. The effect is strongest when the pictures represent common, concrete things compared to more abstract ideas. You can see the picture superiority effect used widely in marketing communications such as posters, billboards, brochures, annual reports, etc. The effect should be kept in mind too when designing slides (images and text) that support a narrative, though this is often neglected as most people opt for bulleted lists. I have pointed to these PowerPoint-like posters in Japan for Japan Tobacco before (and here too) as they are a good example of pictogram-like images plus text that express a clear and even emotional (humorous) message. So what about the power of pictograms? Pictograms are images that represent a word; they are iconic representations of an object or an idea. For example, symbolic signs are pictograms altered to create new meaning, such as a bright light bulb (“idea”) or a skull and cross bones (“danger, poison,” etc.). An ideogram is a graphic of a nonrepresentational idea such as the ubiquitous red circle with a line through it ("prohibited, do not," etc.). You see these kind of signs and symbols everywhere especially in airports, in international tourist destinations, etc. They are used today to create simple, iconic images that can communicate a message clearly in an instant and across cultures. Not all pictographs or ideograms translate well, in fact they are often culture specific. For example, while we were out on a bike ride along Osaka Bay over the weekend, we took a break to buy some fresh bentos and iced tea for the day’s trek. As we entered the local super market I noticed this sign (below). This sign cracked me up, but my wife thought I was nuts for finding anything odd or amusing in this. No Smoking. No Photography. No….Bombs? When I first saw this sign the three messages I received in an instant were “ No smoking,” “No pictures,” (reasonable) and “No….bombs?” What? No bombs? That can’t be right I thought, so I read the redundant text messages that appear under each image. The text under the “bomb” says “Do not bring in dangerous items.” “No Smoking” and “No Photography” are concrete ideas and specific, but “No Dangerous Items” is a bit more abstract or at least not specific. What exactly constitutes a “dangerous item”? And is there a better way to visually represent the idea of “No dangerous items” other than an image of the kind of bomb with a burning fuse that is commonly used in Saturday morning cartoons? Because I am more of a visual person it is the images not the images plus text together that stood out to me. 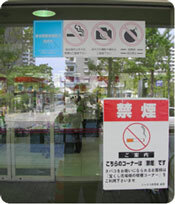 The first two images (No Smoking, No Photography) need no text at all to be understood in Japan, they are common. In the case of the “bomb” it is the image and the text together that gave it meaning. So perhaps the bomb graphic at least helped the message get noticed. Just an image of the bomb alone may not be understood in Japan either (though frankly nobody notices these signs anyway, hence the need for two No Smoking signs on the same door). Culture surely plays a role in how pictorial representations are interpreted. My wife did not at all share my fascination with these pictographs. The black cannon-ball type bomb is commonly used in cartoons in many cultures and holds the same place as the rubber chicken as a comedic prop (a rubber chicken is not widely understood as a comedic prop in Japan, however). You can even find the bomb clipart in various forms available for download on the Microsoft website. This particular case is not a big deal, but it is a reminder that when we are going to present overseas it is wise to take the time to consult our host country counter parts and advisors to see if all our messages — including visual ones — are understood in the same manner we intend for them to be. The world is a pretty small, interconnected place these days, but one’s culture still influences the interpretation of graphic depictions so it is best to see if our visuals “translate” well. Graphics usually “translate” more easily than words, but this is by no means always the case. Since the understanding of visual representations is usually a learned skill, technical communicators must be particularly careful as the levels of visual literacy will vary widely in different parts of the world. Presentations enhanced with effective visual support are usually better than presentations given without visual enhancers. But no one says you have to use PowerPoint or Keynote or any other form of digital multimedia for that matter. Before there were projectors and computers — even before there were overhead projectors (remember those?) — there were flip charts and large pads for presenting your ideas in visual form to your audience. While I spend most of my time working with people who are using multimedia and new media, I actually am a big fan of the ol’ “large pad and marking pens." I really like the idea of "getting off the grid," stepping away from the computer and “going analog” in the preparation stage of the presentation process. Large sheets of paper and marking pens — as “old school” as they may seem — can be wonderful, simple tools for presenting your ideas or recording the ideas of others. When I was at Apple, I used to lead brainstorming sessions by sticking large “Post-its” on the wall. I wrote the ideas down or others would step up and sketch out their ideas the old fashioned way while arguing their point or elaborating on ideas by others. It was messy, but it was a good mess. By the end of the session the walls would be filled with these large “Post-its” which I then took back to my office and stuck on my own walls. As I (and others) developed the structure and visuals for the future presentation, we often referred to the myriad sheets on the walls which were on display for days, weeks, and months. I know many people plan their presentations right from the start using software tools, but I don’t recommend it. There’s just something about paper and pen and sketching out rough ideas in the “analog world” in the early stages that seems to lead to more clarity and better, more creative results when we finally get down to representing our ideas digitally. Large pads for live presentations? During my training as a Peace Corps Volunteer in the ’80s, flip charts and marking pens were ubiquitous teaching aids. A great advantage of these tools, of course, is that they require no electricity. This was a powerful advantage since there often was no electricity. 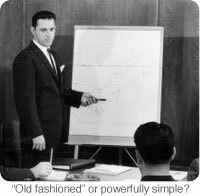 But for live presentations in modern offices and schools today, is there still a place for flip charts and marking pens? Absolutely there is. And since slide presentations — especially poor ones — are common place, keeping the lights on and using only paper and pen for your visuals may be a much appreciated differentiator. 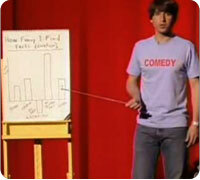 Below are two on-stage presentations by comedian Demetri Martin who uses flip charts (“large pads”) to visually enhance his messages. These clips are a good follow up to the last post on PowerPoint humor; I guess you can call these "flip chart humor." Enjoy. 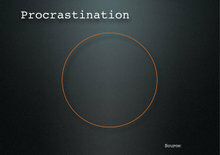 Demetri Martin uses flip chart to display "findings"
LEFT: Pie chart about procrastination. 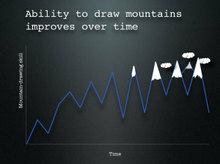 RIGHT: Ability to draw mountains over time. 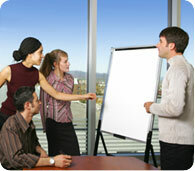 Here are a few links where you can learn more about the art of presenting with flip charts. PowerPoint is a great tool for displaying visuals that enhance, illustrate, and generally magnify your narrative. It’s been used effectively for years by millions of professionals from such disciplines as academia, engineering, medicine, business, education, government (mostly ineffectively in this case), design, technology, and comedy. Comedy? 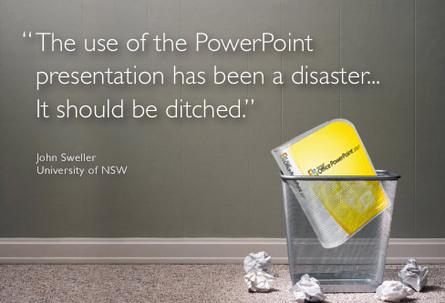 Below are a few examples of presenters using PowerPoint to help illustrate their messages. In each case the tool actually enhanced the presenter's ability to make a connection with the audience and drive their messages home. The first two presentations are by Don McMillan. Don is a former engineer with a Masters degree in Electrical Engineering from Stanford. 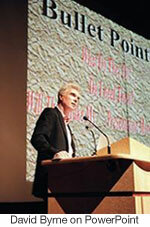 He gives some good advice on using the PowerPoint tool properly. Is there life after death by PowerPoint? Whoever it was that designed humans did a pretty good job, McMillan says, but they provided no good documentation. McMillan has compiled his own data and shares some of it below in what he calls the Users Guide to Life. Standup economist Yoram Bauman (he’s an actual economist too) uses PowerPoint and bullet points to effectively state his case. See, bullet points are not always a bad thing. It is said that only about 7% of our messages are expressed verbally. Is it possible, then, to make a connection with an audience and make meaning using traditional death-by-PowerPoint techniques and limiting your vocabulary to one word? Watch this presentation below by Doug Zongkers and find out. No PowerPoint here, but what would presentation comedy be without reviewing a presentation from business guru and Renaissance man David Brent (Ricky Gervais), know for his maverick management techniques and political correctness. Below David gives tips on motivating employees. Last week an article appearing in The Sydney Morning Herald entitled Researcher points finger at PowerPoint generated quite a stir. The article highlighted findings by researchers from the University of New South Wales, including John Sweller who developed the Cognitive Load Theory back in the '80s. One of the findings mentioned in the article: it is more difficult to process information if it is coming at you both verbally and in written form at the same time. Since people can not read and listen well at the same time, the reporter suggested, then this may mean "the death of the PowerPoint presentation." The assumption being (apparently) that a presentation made with the aid of slideware such as PowerPoint or Keynote necessarily includes lines of text projected on a screen that mirror the spoken word of the presenter. 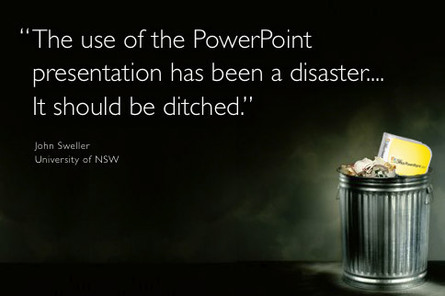 "The use of the PowerPoint presentation has been a disaster. It should be ditched." Professor Sweller's comment makes a provocative headline and adds to the long list of professionals and researchers deriding the PowerPoint tool. I have added the professor's quote to my talks on the Presentation Zen approach. Two versions of the slide appear below. "I do not think it makes sense to refer to PowerPoint as a method. Instead... PowerPoint is a medium that can be used effectively — that is, with effective design methods — or ineffectively, that is with ineffective design methods. We would not necessarily say that books are rarely a good method, because books can be designed using effective or ineffective methods." I first read about the cognitive load theory as it relates to presentation in Richard Mayer’s Multimedia Learning. Sweller’s work is often cited in Multimedia Learning and many of his publications are also online. In this paper, for example, called Visualisation and Instructional Design (pdf), Sweller discusses several of the effects related to the cognitive load theory. For example, the modality effect shows that ”working memory can be increased by using dual rather than a single modality.” That is, it is more effective to target both the visual and auditory processors of working memory. Another effect in the cognitive load theory is called the redundancy effect (also outlined by Mayer in Multimedia Learning). The redundancy effect says that if one form of instruction (such as the spoken word) is intelligible and adequate then providing the same material in another form (such as lines of text on a screen that mimic the words being spoken) are redundant and can actually hurt understanding. This may seem counterintuitive and it certainly runs counter to many of the ways presentations are made in business or lesson taught in schools. In the scenario describe by Sweller above the diagram uses a visual modality and the speech uses an auditory modality which should result in greater working memory capacity and better understanding, depending, of course, on what is being presented. What to do about PowerPoint? 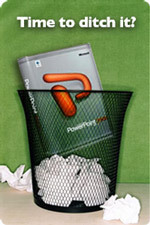 So, is it finally time to ditch PowerPoint? Hardly, but it is long past time to ditch the use of the ubiquitous bulleted-list templates found in both PowerPoint and Keynote. And it’s long past time that we realized that putting the same information on a slide that is coming out of our mouths usually does not help — in fact usually hurts our message. Next time you plan a presentation, then, start by using a pencil and pad, a whiteboard, or a stick in the sand — anything except jumping headfirst into slideware on your computer with its templates, outlines, and content wizards that may point you down a path you wish not to go. And as you examine your work from previous talks remember this rule of thumb: if your presentation visuals taken in the aggregate (e.g., your “PowerPoint deck”) can be perfectly and completely understood without your narration, then it begs the question: why are you there?